For use with 430 SW handpieces. Contains: 2 large green and 2 small green o-rings. Fits standard Midwest-type 4-hole fiber optic tubings. For use with 430 SWL or Solara handpieces. 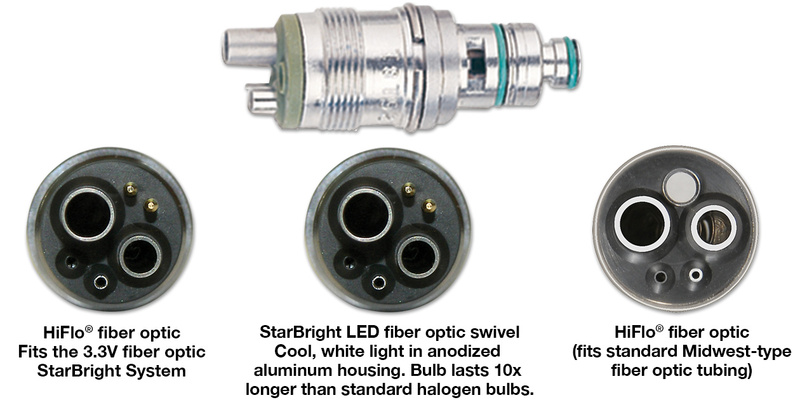 Fits the 3.3V 6-pin fiber optic StarBright System. For use with 430 SWL or Solara handpieces. Cool, white light in an anodized aluminum housing. Bulb lasts 10 times longer than standard halogen bulbs. 70% lighter weight.